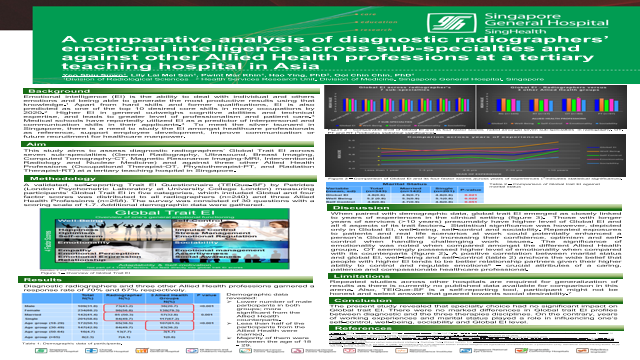 This poster was presented at 20th ISRRT World Congress 2018 in Trinidad & Tobago April 12-15, 2018. Abstract: Objective: This study aims to assess diagnostic radiographers’ Trait Emotional Intelligence (EI) across seven sub-specialties (General Radiography, Ultrasound, Breast Imaging, CT, MRI, Interventional Radiology and Nuclear Medicine) and against three other Allied Health Professions (Occupational Therapists-OT, Physiotherapists-PT, and Radiation Therapists-RT) at a tertiary teaching hospital in Asia. Method: A validated, self-reporting Trait EI Questionnaire (TEIQue-SF) by Petrides (London Psychometric Laboratory at University College London) measuring participants’ Trait EI in five categories, which include Global (general emotion functions) and four factor scores (Well-being, Self-control, Emotionality and Sociability), was distributed to all radiographers (n=240), and three other Allied Health Professions (n=258). Additional demographic data was gathered. Analysis was generated using ANOVA. Results: The radiographers’ group and three other Allied Health professions garnered a response rate of 70% and 67% respectively. There was no statistically significant difference in Global EI and its four factor scores amongst the seven sub-specialties in radiography, OT, PT and RT. A significant correlation was found between global EI and self-control in all Allied Health professions with more than 10 years working experiences compared to 1-3 years (mean difference 0.36, 95% CI (0.08, 0.63), p=0.004 for global EI); (mean difference 0.49, 95% CI (0.15, 0.84), p=0.001 for self-control) and 7-10 years (mean difference 0.32, 95% CI (0.02, 0.62), p=0.03 for global EI); (mean difference 0.54, 95% CI (0.16, 0.91), p=0.001 for self-control) of experiences. Global EI was also positively related to married status (mean difference 0.16, 95% CI (0.02, 0.30), p=0.021). Conclusion: Findings of study revealed that specialty choice had no significant impact on EI. There were no marked differences in EI profiles between diagnostic and the three therapies disciplines. On the contrary, years of working experiences and marital status played a role in influencing one’s self-control and Global EI level. Summary: This study aims to assess diagnostic radiographers’ Trait Emotional Intelligence (EI) across seven sub-specialties (General Radiography, Ultrasound, Breast Imaging, CT, MRI, Interventional Radiology and Nuclear Medicine) and against three other Allied Health Professions (Occupational Therapists-OT, Physiotherapists-PT, and Radiation Therapists-RT) at a tertiary teaching hospital in Asia. References: 1. Blanch, A. (2015). Emotional intelligence quotient (EQ) and workplace achievement. Robert Half. [Online]. Available from: https://www.roberthalf.com.au/blog/emotional-intelligence-quotient-eq-and-workplace-achievement. [Accessed 01 October 2016]. 2. World Economic Forum (2016) Skills stability. [Online]. Available from: http://reports.weforum.org/future-of-jobs-2016/skills-stability. [Accessed 25 July 2016]. 3. Faguy, K. (2012). Emotional intelligence in health care. Radiologic Technology. 83(3), pp. 237-253. [Online]. Available from: http://sciencedirect.com [Accessed 01 November 2015]. 4. Codier, E., Kooker, B. and Shoultz, J. (2008). Measuring the emotional intelligence of clinical staff nurses. Nursing Administration Quarterly. 32(1), pp. 8-14. [Online]. Available from: http://sciencedirect.com [Accessed 15 November 2015].